The long-running radio soap opera set in the Sea Cliff neighborhood. This story is dedicated to “the mothers and fathers of the younger generation, and their bewildering offspring.” If you knew where that quote came from you’ll continue reading for sure. If you didn’t then stay tuned. You might learn something. The words opened “One Man’s Family,” radio’s longest running drama and the product of the fertile mind of Carlton E. Morse who lived in a rustic mansion in Woodside, CA called “Seven Stones” which became “Sky Ranch” on the popular NBC series that ran from 1932 to 1959 and had a listening audience estimated at 20 million people. 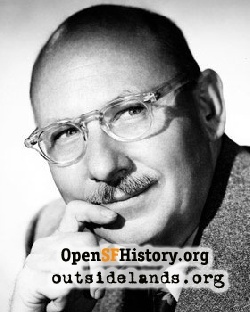 Morse Lane, just off Highway 35, is named after the prolific author of radio dramas who insisted his work not be called “radio soap operas,” even if that was what they were. 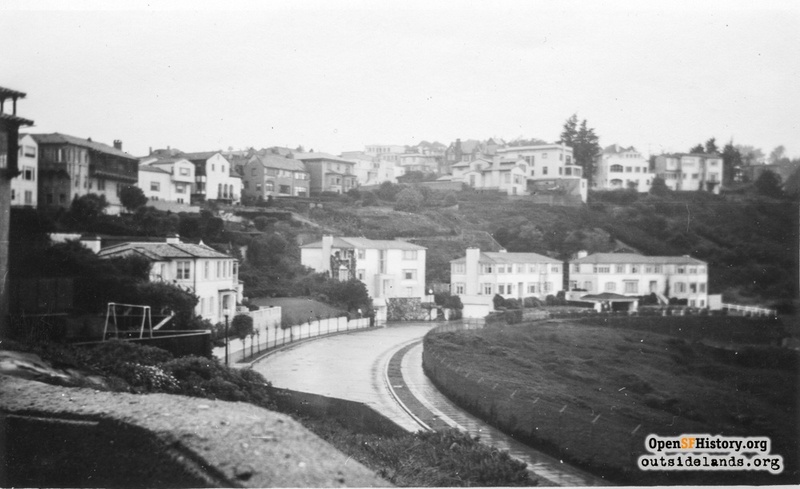 One Man’s Family told of the trials and tribulations of the Barbour family that lived in the posh Sea Cliff section of San Francisco. “The Barbour family was the best-known and best-loved family in the United States” during its time on radio, wrote the late Dave McEllhatton, a popular news anchor at San Francisco television station KPIX. McEllhatton’s assessment came in “The One Man’s Family Album,” which I found in the Friends of the Library bookstore in the Redwood City main library on Middlefield. The book was signed by Morse, who died in 1993 at the age of 91, “To Jim, Christmas 1988, Carlton E. Morse.” I don’t know who this “Jim” was but thanks for donating the book. If for no other reason the book is worth keeping because the signature proves Moore’s first name was Carlton, not Carleton as sometimes seen. The book is subtitled “An Inside look at radio’s longest running show.” Today it is difficult to understand why the show was such a hit. Debuting during the Great Depression that throttled America, the show was no Grapes of Wrath. Not only was the setting in upper class Sea Cliff, the main character, father Henry Barbour, was the head of a bond house, not exactly a popular occupation when the market crash was blamed for the nation’s economic ills. Yet I remember my mother, a staunch Democrat, following the Barbours as if they lived next door to our rented home in San Francisco’s Richmond District, which, in a few years, we would leave for our own home in the Sunset, purchased in the post-war years when the economy roared. Even my dad, who worked six days a week, took an interest. 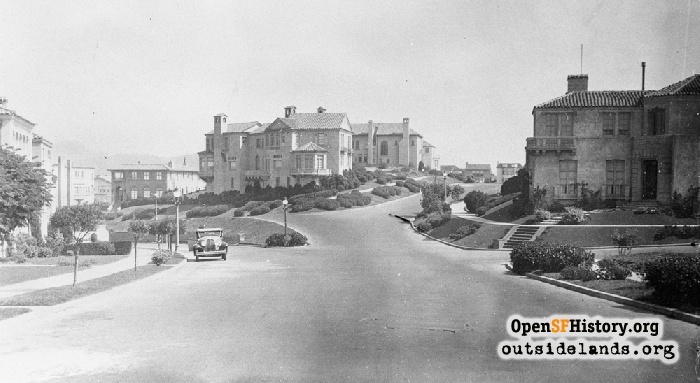 The Barbour family was so real to its followers that the Sea Cliff home was on the route of sightseeing buses even though it didn’t exist. With a child’s faith, I believed the Barbours lived in San Francisco. There were many references to San Francisco, including the Golden Gate which could be seen from the Barbour’s window. Besides, I think I was influenced by the fact that the first name of one of the five children was “Clifford.” The other siblings were Paul, Hazel, Jack and Claudia, who was Clifford’s twin. Today we live in a round-the-clock media-centric culture, but in the days when radio ruled families gathered in the living room with the timing of clockwork to listen to their favorite shows. FDR’s talks to the nation weren’t called “fireside chats” for nothing. In those days radio was what many called “the theater of the mind,” meaning the listeners could render their own version of the shows character. This could be one reason many radio shows failed when they jumped to television. Reality couldn’t match fantasy. 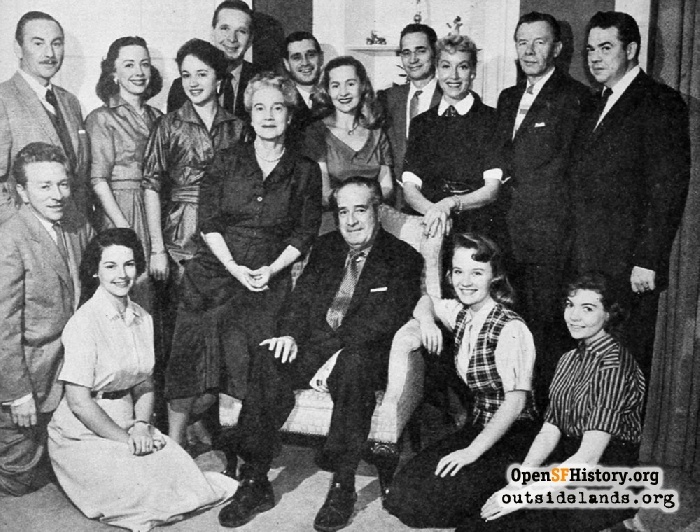 The television version of “One Man’s Family” lasted from 1949 to 1952 in prime time and from only 1954 to 1955 during daytime. This was roughly the time the Bob and Ray show gathered a following of its own on CBS radio. Bob and Ray parodied just about every media darling and “One Man’s Family” was a prime target. Bob and Ray turned the show into “One Fella’s Family” and christened the Barbours the “Butchers.” It was clear times were changing. The “mothers and fathers of the younger generation” phrase could be taken literally today when “single parent” and “babies having babies” are no longer whispered words. Not so when Morse took up residence in Seven Stones, the Woodside home he started living in soon after he gave birth to the Barbours. The first episode on April 29, 1932 informs the listener that the show is “neither an expose of youth’s foibles nor an accusation against the older generation. It is merely a cross-section of the life of a modern family, given with the hope of explaining father to son and son to father.” What about the mother? Morse is quoted in the Album as describing Mother Fanny Barbour as “a staunch weather vane in a stormy climate, pointing always to the eventual triumph of fair weather.” It was clear Mrs. Barbour was a traditional mother and wife who was dedicated to family above all. Morse, the eldest of six children, was born in 1901 in Jennings, Louisiana and moved as a youngster to Oregon where he was raised on a dairy and fruit ranch. The family eventually settled in Sacramento and Morse attended, but did not graduate from, the University of California at Berkeley. 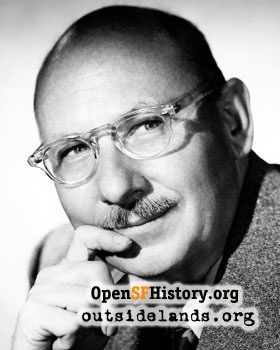 He wrote for newspapers before getting a job with KGO radio in San Francisco in 1929. In 1928 he married Patricia De Ball, who died in 1984. He then married Mildred who lives in Boise, Idaho. Mildred spoke lovingly of the home the two owned in the La Honda area off Skyline. An extensive 1946 newspaper feature story said Morse liked the quiet serenity of San Mateo County’s redwoods. The article also placed his salary between $150,000 and $250,000 a year, a big bundle in the immediate post-war years. The home built in 1934 wasn’t much compared to Sky Ranch, its fictional counterpart, Morse told one reporter. Sky Ranch was “pretty swish. Lots of money,” he said. In Morse’s mind, Sky Ranch consisted of more than 300 acres while Seven Stones was only 50. Sky Ranch, a converted farmhouse, had a swimming pool while Morse’s comparatively modest redwood dwelling was built from scratch and didn’t have a pool. Both sites, however, had enough room for horses. The main house at “Seven Stones” was built of redwood ties, giving it a log house appearance, reported one “Design for Living” piece. Antique bricks in the patio and veranda were from an old winery in Redwood City. Old pine paneling that was hand-rubbed lined the entrance and hallway. Sky Ranch was often part of the show’s setting, as were other Peninsula locales. The Barbours often talked about going to Woodside for groceries or to Redwood City to visit Pinky’s to get bubble gum. It was on the road from Skyline Boulevard to Woodside that Clifford’s wife Irene was killed in a head-on crash. According to The Los Angeles Times, Morse sold his final 13 acres in 1986 with the stipulation he could live in Seven Stone for the rest of his life, which ended in 1993. Morse’s name was added to Hollywood’s Walk of Fame in 1960, but show business was not the only area where he left his mark. He is part of aviation history because he was the first round trip paying passenger aboard Pan American’s pioneering China Clipper, the flying boat that flew across the Pacific. Morse made a recording about his flight from San Francisco to Hong Kong, a 10-minute broadcast that is on file with the Library of Congress. Morse called the experience “a dream come true.” The trip took six days with stops at Honolulu, followed by those with strange names like Wake Island and Midway, names that would soon be familiar as World War II battles. The 7,000 mile flight was covered by a plane that flew only 125 miles per hour, with the actual air time 120 hours. That’s pretty slow by today’s standards. What seems even more of a contrast is the way the 16 passengers were pampered when compared to today when fights are waged over leg room. Morse said the trip was made in grace and style. Seven stewards, all male, served meals or refreshments every two hours. Passengers read, played cards, talked or watched “the panorama” of clouds and sea, Morse told his listeners. The Clipper’s central lounge was wider than a Pullman club car and was fitted with broad armchairs. China and silverware was used. Still, the flight proved tough going for some passengers who left at the island stops and boarded ships. Morse said in the NBC Blue broadcast in May of 1937 that the schedule was just too grueling for some. The plane stopped to refuel, take on other supplies and mail. The passengers stayed at hotels while the tasks were performed. The passengers had to get up by 4 a.m. to board for the next leg of the flight, which proved too tough for some, Morse said. The round trip fare was $1,438, a lot of money in 1937 - for any man’s family. Contribute your own west side stories. More by James O. Clifford, Sr.
all articles by James O. Clifford, Sr.